My home internet is rather slow, and I think this was the main issue with the firmware update process timing out. I decided to download an iso of all firmware for the server called HP Service Pack for ProLiant 2013.09.0 (B), which you can also download from here: hp.com – note you have to sign up for a hp account first, and the download is 2.9gb. I was able to install Windows Server 2012 R2 using Intelligent Provisioning, which nicely installs all the required drivers without you having to think about it and that worked perfectly. Getting the lid of the case off and on was very simple to do, just two thumb screws at the back lets you lift the entire sides and top off in one piece. You can access pretty much everything internally you need to at that stage due to the convenient design. Next up, by default the server can take 4 x 3.5″ HDDS, and a 9.5mm CD/DVD drive. Luckily this means if you don’t need the CD/DVD drive, you can have an extra 2.5″ HDD as your OS install, leaving the other disks for your actual data. 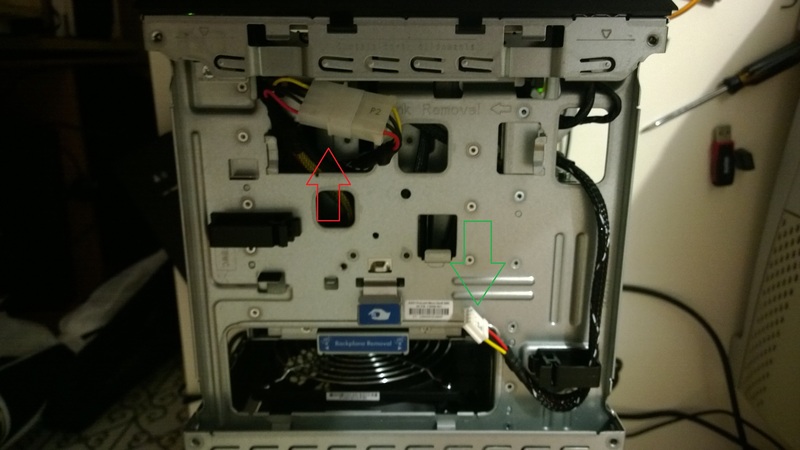 A good idea since you can use the remaining SATA port on the motherboard, but there’s no spare SATA power cable, as the CD/DVD drive uses the old style floppy disk power connector (as per the green arrow on the photo below). There’s a molex connection nearby (red arrow) so I pulled that through the gap, and added on a double adapter on the molex, then added a molex > sata adapter to finally get power to the extra hard drive. When I had a drive in the first bay, the server decided that was the preferred boot device. To fix that, I changed the boot order to use the second SATA controller first, as it seems the spare SATA port on the motherboard is connected to that. The first controller goes to the first two HDD bays, and they run at 6Gb/s, compared to the 3Gb/s of the 3rd and 4th bays plus the separate onboard SATA port. This is worth keeping in mind for what drives and data you plan to configure. As mentioned in the previous blog post, there is a MicroSD slot on the motherboard as well as an internal USB port – neither are useful for a Windows OS unless you’re using Windows To Go. The MicroSD is a bootable device, but also it’s handy as a swap drive or pagefile. Other OS’s that support running off a USB such as ESXi can be used too. The hard drive bays aren’t hot swappable (unless you buy a separate RAID card, put that into the single empty PCIe 2.0 slot, and connect the drive bay to that instead), but that’s not really a problem anyway. They are quite easy to use, so at least when you have to add or remove a hard drive, you won’t have any physical complications. For the RAM, I first tried a few sticks of NON-ECC DDR3 sticks, but the server wasn’t happy with those (one was even HP branded). After putting in the first ECC stick I could find, it worked and was bumped up to 4GB. I’m not planning on running VM’s off this thing, so that’s plenty for me. On the switch side of things, the HP PS1810-8G is a nice fit. Resting on top, it moved ever so slightly when pushed down on so I decided to put it below the server instead, and it is now rock solid. It’s fanless, so you won’t hear it. It can also be powered by PoE, which isn’t very useful in a small business environment, but would be useful if you had an upstream PoE switch – which in that case, you wouldn’t have this MicroServer on top or below it. Regardless, there’s no harm in it being there :) Either way, It runs at 7.2 W maximum, so it’s drawing even less power than many of the standard power saving compact fluro bulbs. The web interface is plain but very useful with a decent amount of options. Instead of running three separate network cables to the server, it is nice just to run one to the switch, then have three cables going up to both NIC ports and the iLO, which makes it much more self contained. Over at GeekZone, Mauricio Freitas has also been playing with the HP server, and had a thread about it along with pictures. Worth having a look. I also found a thread at avforums.com which had more great info, and there seems to be a configuration consideration around trying to use the spare SATA port on board (used for the CD/DVD Drive) as a boot device when the HDD bays are fully populated. I agree with the fix of adding in a PCIe Sata controller, which will then let your extra hard drive be bootable. This in turn could allow you to attach an SSD to the 5th internal SATA port, and then with Windows Server 2012 R2’s tiering options you’d have a pretty decent HDD setup! Pricing – there’s no RRP that I can find, but you’re looking around the $500 mark. Shop around of course. So, it’s still a great bit of kit, but as with most things there’s a lot of considerations and adjustments to be made to make it fit exactly how you want – but that’s where the fun is. Hey watsup, can you please hook me up with a copy of gta 5 for my ps3, ikno this is a weird place to post this but its the only way i can reach you lol. You’ve won the ‘strangest request’ prize for my blog. There’s no physical prize though, just the recommendation to visit your local game shop to obtain a copy of GTA 5 for PS3, as long as you’re old enough. I was wondering how safe is embedded raid controller (Smart Array B120i) even if he doesn’t have backup battery and additional ram memory for cache ? I buy-ed this server a few days ago and I just added 2 WD RED 2TB HDD in raid 1 (mirror) and I want to keep some important documents on it . Or should I add a dedicated Raid controller to be more safe ? . IF the server will freeze and I need to power off from button , raid matrix will know that he need to check ? Try asking this question over at Geekzone on the thread about it http://www.geekzone.co.nz/forums.asp?forumid=86&topicid=130728 as I know what you’re asking, but not sure what the answer is. If you have a UPS that just reduces the chance of a brief power outage, it might send a shutdown command to the computer to safely turn off before the power completely goes, but in the event of the actual computer losing power I’m not sure how it handles it. No onboard battery and ram cache does seem to indicate it’ll be an instant stop. It’d probably work – but the PSU in this server is only 150w while the official power requirements of the card is 300w according to Nvidia http://www.geforce.com/hardware/desktop-gpus/geforce-gt-630/specifications – but the actual draw of the card is fairly low depending which model you get. There’s not a huge amount of space but the card seems fairly small too so hopefully would fit. Hi. I now own this server as well, and I’ve configured software RAID in Linux because, even though I tried using the onboard controller, Linux wasn’t fooled by the apparent logical drives, and detected all the hard drives itself, even though RAID 10 was configured. That being said, I let it go in AHCI mode and with software RAID 10. I wish to know if you can hot plug / hot swap the hard drives when in AHCI mode, since most AHCI capable controllers allow you to do that, but it’s unspecified. For example, I can hot plug and hot swap hard drives on my desktop PC with no problems, even if the ports aren’t set as eSATA. Logically I’d agree with you – any normal desktop PC accepts hot swapping since you’re not using raid, but it still might be a limitation of the controller that talks to the SATA drives anyway – maybe an older style to cut costs? It should still come down to the storage controller specs, which according to this from hp http://h18000.www1.hp.com/products/quickspecs/14343_div/14343_div.pdf does support hot swaps. Hi, Just bought this server and waiting for it to arrive, I have bought a 9.5mm ODD converter so it will fit an SSD in place instead and got the relevant converters etc… After reading your article just wanted to confirm, the 5th (spare) SATA port on the Motherboard can be used to boot from? I’d assume yes otherwise the CD drive would be pretty pointless. Looking forward to when it arrives! Also wanted to check what your thoughts were on the noise levels this server produces? Yes that’s correct, I’m booting from the SSD plugged into the 5th port while the 4 bays are populated with 3.5″ HDDs. Noise levels – very quiet, unless it’s hot in the room. On a rather warm day in Australia without air conditioning on, it will spin the fans faster and be rather noticeable. Normal conditions it’s really quiet. So I guess noise will be a non issue, I’m planning on using 4 3TB WD Red’s and from what I’ve read they’re relatively quiet as well, only reason I care is because it’s got to be stored in our front room as that is where the router and stuff is. Awesome, SSD is sat next to me, just waiting for the dang thing to arrive! Thanks for your help, most appreciated. Let us know how you go if you remember, would be good to know about your experience! Ah good, for what it is with size/cost etc it’s good – but the CPU will limit your VMs! Hi Sean, I did indeed have the same issue however, it turns out that port is directly attached to the RAID controller, When you boot up the server get into the RAID controller and you’ll find the drive listed in there, you’ll have to create a logical drive in there and choose the boot sequence in there as well. I am using a 250GB Intel SSD and I can confirm this was the only way I was able to get the drive to show up. It still won’t show up in the BIOS as a separate drive however as the RAID controller takes care of that. Thanks Chris for replying to Sean – great info! Has some found a way to boot from the 5. hdd while the sata controller is in ahaci mode? Hi Fabio, As per the comments above, you have to configure the ODD sata from the RAID controller once you have set it to AHCI in the BIOS, you then set the boot order in there. I have the same problem as Fabio. I can’t boot from sata 5 after installing openmediavault on my ssd. The only solution for this problem to solve is, to switch the sata 5 to sata 1. But I don’t want brick the cables and the HDD tray. If you have a solution for me, I will very nice of you!!! Help me please. I’m searching all over the forum and the worldwideweb and didn’t find nothing about this problem. Paying the price for lack of research and realised this doesn’t support raid5 from the builtin raid controller – only raid 0/1/0+1. I’ve got it set up with Storage Spaces with the SS set to parity – which gives me a bit over 7tb over 4 x 3tb drives. I’m not that familiar with the robustness of SS though, and raid5 would get me 9tb diskspace. Has anyone tried adding a raid controller card for this purpose? (either HP or other – not fussed as long as it works…) and if so, got a link to the card? Looks like it costs between $700 and $800 from most sites though, which is more than I paid for the unit itself (although I just saw the price off the HP website is $599 – maybe that’s in the US…). Not sure about cheaper non-HP cards that work (but would be interested if there is a solution for around $200 to $300). I read on one site a statement that to fix a failed drive in Storage Space you had to insert the new drive before removing the failed drive, otherwise you lose your data – I don’t know if that is correct but it flat out doesn’t work if you’re using all 4 slots to start with. So bottom line, for now, I’ve gone with RAID0+1 and ended up with 6tb of space. Not a great outcome given I had an expectation of 9 but can’t justify the cost of the HP brand controller card. Ouch that is a bit rich. I need to look into Storage Spaces to find out, but even if that’s true you could either add a $20 PCIe Sata card or even use a USB3 > SATA connector just to get the data migrated? Either way, Raid 0+1 isn’t too bad but does leave you with 50% less real storage. Western Digital Red’s and Green’s I’ve tried and tested and work. I’ve also tried a few Seagate and Samsung drives which also seemed fine. I’ve tried a WD Black and it works fine but does cause quite a bit of vibration (it was an old 640GB model though so it may have been due to it’s age as i’ve got a newer 1TB one and that is much quieter). SSD wise I’m using an Intel 530 series SSD but I’ve also tried an OCZ Vertex 3, both work fine. I haven’t tried any Hitachi drives but read they also work fine. Basically any 3.5 inch drive seems to work except for a select few drives, I’ve got a Western Digital Velociraptor if you want me to give it a go but I think it’ll raise the temps a little to much for the little server! I appreciate your support, thank you for sharing your experience and knowledge with us. Similar to Chris Burt’s comments from me – I’ve tested low end Seagates and WD Green drives, and using a cheap SSD which I can’t remember the brand (May be Samsung 840). Decide what you want and google it to see if anyone’s had an issue, and chances are you’ll be fine. It really depends on what you plan to do with it, but they seem to be reasonably compatible with just normal PC parts anyway.If you buy one, I don’t believe they come with a hard drive but you can put any 3.5″ drive in it to get started. Already has RAM, and OS again depends on both what you want to do, and what OSes you already know about. Thanks. Basically I am wanting this as a home server to store all my files on so I can access these throughout my house. I have run a full network throughout my house so there are network ports in every room, living area, office area etc. I want to place this unit in my server cabinet where my switch is located, hook it up to the network so that I can access all my files from it. So you can just add a 3.5 drive into it and it will work straight out of the box? or do you need to add an OS? If it needs an OS I would like to keep these separate from the 4 bays as suggested above so that the four bays can purely be used for storage. Stick with whatever OS you know. if your home PCs are running Windows, then install a variant of WIndows on this box. You need to actually install an OS, it won’t come with one – but there are some wizards that are inbuilt to take you through the install. It is easier and faster if you put in a seperate small SSD for your OS, then put in other drives for your data. Drive size, you’ve already researched it right. HP may not update what officially works, but if you’ve found someone else who has a 4TB drive working then you should have the same experience. Great thanks for the info. I really appreciate it. I also have this server (and have been loving it), however run into an odd issue when trying to install either Windows 7 or 8 from the ODD drive (this has worked before, however I decided to run FreeNAS for a bit but didn’t like it. This issue cropped up only from trying to reinstall Windows). The ODD drive is set as the first logical volume in the RAID controller, and on bootup via AHCI mode it detects all 5 drives (4x 3TB WD REDs and 1x 128GB Samsung 840 EVO SSD). However, when the WD REDs are installed, it refuses to boot. As soon as they’re all removed, it boots fine (but this defeats the purpose as there is no storage). Note, installing Windows 2012 R2 with the same drives works fine, but as RAID, not AHCI, so the drives should be fine. When I try to install Windows 7 or 8 (trying 7 again at the moment), I boot the installer off a MicroSD card in the internal slot, and it gets to the ‘Setup is starting’ page, then hangs infinitely. Again, without the WDs it loads the installer fine. I’m at a loss… is the WDs causing the issue? the Controller? Or am I just missing something. I did it purely for convenience, but have also tried via a conventional USB stick as well as the HP iLO Virtual Disc Mount (which I have successfully used before to install Windows), same result; Setup is starting hangs infinitely. Apart from using the HP inbuilt OS installer by pressing one of the function keys (can’t remember which, it’s been a while but it tells you as part of the startup sequence) to try the install as it might load extra drivers, I’m outta ideas sorry, might be worth posting here http://www.geekzone.co.nz/forums.asp?forumid=86&topicid=130728 and see if anyone there can suggest something. If you do work it out please share! Thanks for the feedback Adam, I’ll try the Intelligent Provisioning installer (F10 is the key you’re referring to) shortly. Right now, I’ve resorted to using DBAN (http://www.dban.org) on the hard drives as a last ditch effort, as I have a feeling it’s the Linux partitions on the hard drives that are giving the Windows installer grief (and because they’re more than 2TB, it needs to be converted to GPT as MBR supports no more than 2TB, so in theory giving the HDDs a clean slate should help). So, after 3 days of waiting for DBAN to completely wipe 12TB of data, it looks to have done the trick; so I was right about the partitions on the hard drives not being picked up by Windows at all (thus causing the Windows Setup to hang because it didn’t know what to do with the Linux partitions created by FreeNAS). I deem this to be a complete success! So, for those that are having issues going from FreeNAS to Windows (or potentially anything Linux based to Windows), nuke the partitions with DBAN (or something similar) and you’ll be good to go! Hi was wondering if you could help. I have bought a 310 and the idea is to boot from an ssd connected to the spare port on the motherboard. Then use the 4 disks configured in a raid. However with the raid enabled I can’t see my ssd, it needs to be ahci configured! For info I have tried creating a logical volume via the raid controller but when I attempt to install windows server the ssd does not show up. I run into a similar problem after reinstalling my Windows OS due to the debacle above. You can only do it via IDE as AHCI hides the 2nd controller that runs the SSD/ODD port. If you try via AHCI, the O/S will probably install on the SSD but the MBR will be on the first drive in the 4 bay slots, which then converts the drive into a MBR partition (if you have a > 2TB drive, this effectively wastes the excess space). Mine runs fine on IDE and I don’t see any performance issues (if there was, it’s minimal). You can’t boot from ODD port 5 in AHCI mode because the BIOS scans each port from 1 fo 4 and if the disk from first port is not bootable, it skips to the next boot device type. Try by enabling RAID mode, with the port 5 in RAID 0 configured as Array A ( first array). This should be done before installing the OS on the disks. I have a quick question, I have 2 Proliant G8 servers and one is running a SQL production database. One is live and the other is unplugged and not setup. The one that is running is flashing an Amber system light instead of a Blue light on the front of the server. I want to know if I can remove the hard drives from the running server and put them into the unplugged server and it will run just like the running server?? I have been left with this as the guy who had my job before me was fired. I will just go for it and see what happens, I will let you know how I get on. I’ve just purchased an HP G1610T G8 Microserver and I’m trying to install CentOS7 on the machine. I’ve put 4 x 3Tb HDD in the box, and I want (would prefer) to use the embedded RAID controller to manage them. At this stage though, I’ve not had much luck. I’ve downloaded hpvsa-1.2.10-120.rhel7u0.x86_64.dd.gz and upzipped it, renamed it with .iso extension and put it on a FAT32 USB. Then when I boot the CentOS install disk, I’ve tried several methods to get it to work. 1. I press “tab” on the install screen and add “modprobe.blacklist=ahci inst.dd” to the command line. 2. I press “escape” on the install screen and type “linux dd blacklist=ahci”. Both times without the quotes, and both times the process appears to locate the USB, and extract the RPM files for installation. But when I get to the install, I still don’t see the drives as I’ve configured them using the Bi20i Smart Array controller. If you have any advice it would be appreciated. Hi, great articles and further Q/A ! Thank you. I would like to plan so install 5th hd as you showed in the picture leaving 4 bays for HD in LVM Striping (using Linux). I would like to have best performances. Now my question is if anyone tried this configuration. The second bay couple have 3 Gb/s, halving then the performance of the first bay couple. Maybe this have a bad impact on overhall performances that do you know ? I found this site while searching for an answer to the internal USB boot – but did not find the answer here but good article. I have the MicroServer gen 8 with two 1G Satas that are RAID 1. I was able boot off an bootable USB, plugged into the front USB, with ESXi 5.5. Installed the ESXi onto a 8G USB stick plugged in the internal USB slot. Set the BIOS settings to boot from the internal USB DriveKey, rebooted the unit but no luck. Tried different settings in the BiOS but all unsuccessful. I did the same type of install on HP ML310e Gen8 server and it worked fine and is in production. Hi – great article. Can I just check, is the molex connector at the top of the box that you use to power the SSD totally redundant and is not needed to power anything else on the system such as the raid board? I ask as I have used it to power my SSD and cannot get my array drives to show in the raid array setup menu and so wanted to check that I didnt need to split that connection off to also power the raid controller. Also, I have killed my OS install by changing the SATA controller BIOS settings and I think I will need to format the drive to re-install. Is there a means to run a drive format? I can confirm that you can use the floppy style molex to power a HDD in the ODD drive. I just had a few older PCs and ripped the floppy power port out. I just cut it with pliers and found a SATA power cable from an older PC that also had attached a floppy power connector. It may not look pretty, but it did the job. And you can boot from a HDD installed in the ODD bay, but you need to create an empty volume on it, before you install an OS.